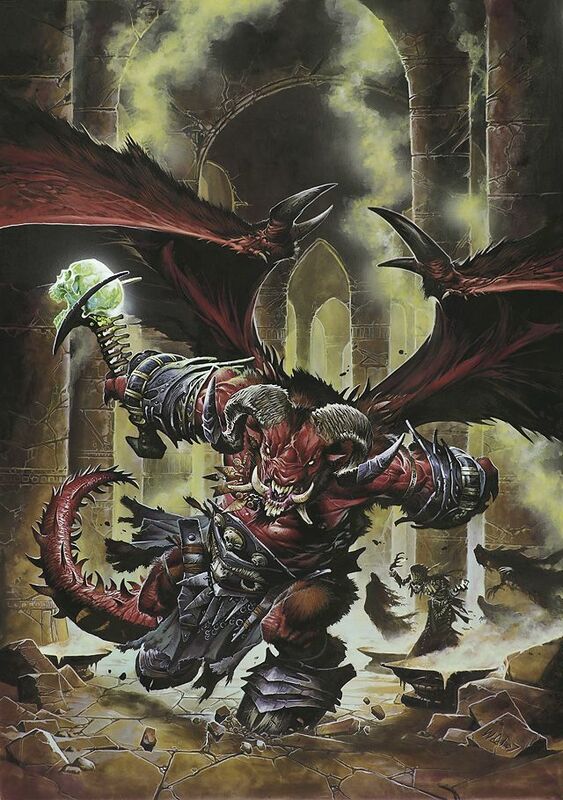 Also known as Orcus, thanks to Dungeons & Dragons, there are many fantasy art renderings of this one. The Forsaken Isles has a unique take on the Jade God. He embodies the entire dominion of Necromancy. The eldar did not realize that healing also crossed through this dominion. When Time moved, Orcus took the sub-nexal gate of the 665th and always remained adjacent to the Gate of Chaos. The Jade God's reaction to Time, like all of the eldar subjected to it, was extreme. He wanted to freeze it all exactly how he liked it. Unable to do so in the Tehran Universe, he retreated to what he named the "Endless Worlds." In these worlds, both the living and the undead reign under a Jade Star, that is Orcus. There is no day or night. The denizens live and die exactly as Orcus requires. Every once in a while, he has dabbled in the Tehran realms. For a long time, he was content to taste it through necromancers raising his creations in Tehra. But, he resented the control that other gods had over those creations and sought a more personal touch. He got his first taste when Bomoki began crafting the gate runes attuned to Chaos. Bomoki became his first free-willed worshipper and Orcus liked it. Thinking a powerful undead would be an even better worshipper, the Jade God took a powerful mage questing for immortality, named Nientro, and transformed him into a free-willed vampire. This is not what Nientro wanted and he began to plot revenge, while helping Orcus feel that his Tehran plans were working. Ultimately, Nientrol contributed to the Jade God's fall. Because it's expensive to travel to Tehra, Orcus learned to harvest worlds within the Endless Worlds to create what he variously called a "hellhound" or "wand." They're essentially the same thing though Hellhounds can move and wands need a wielder. Their purpose is create opportunities for Orcus to come to Tehra at less nexal expense. They're rarely successful. Bomoki's Gate provided the most powerful means of doing this and Bomoki became the most powerful of all the hellhounds. This led Orcus into direct conflict with Morbatten and that story is told in the book, Bomoki's Gate. The green jade color of bones from the Endless Worlds is why Orcus is called the Jade God. Also, unlike most every other eldar, Orcus did not shy away from using his real name in hopes that it would summon him to Tehra and other interesting places often.